SUPERSONIC Swiss ‘Tiger’ jets; a vintage De Havilland Dragon from the 1930s and three newly-restored Chipmunks flying in retro Air Corps colours are taking to the skies today at Bray Air Display, which kicked off at 2pm. The 10th annual Bray Air Display is part of the Bray Summerfest and supported by the Irish Aviation Authority, with a full afternoon of aerial and aerobatic spectacle planned. 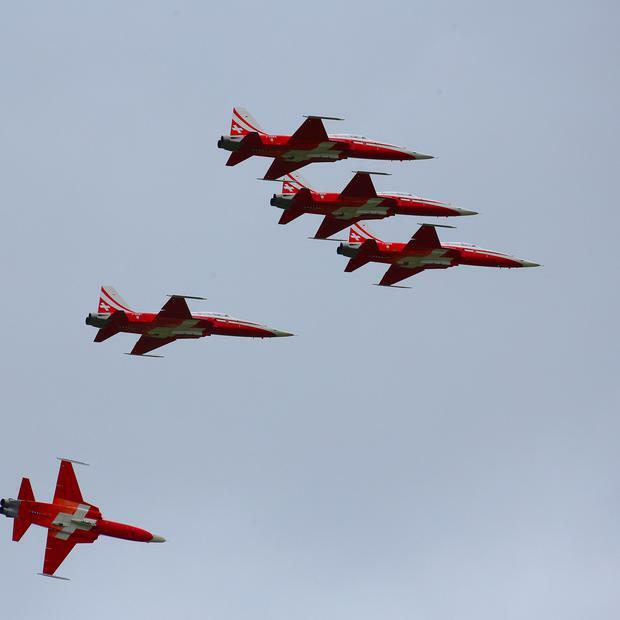 Making their Irish-debut, the Swiss Air Force aerobatic team, known as Patrouille Suisse, will fly their supersonic red and white Tiger aircraft, reaching speeds of between 250 and 1,100 kilometres per hour. They will be performing precision formation flying manoeuvres such as the “Delta”, the "Roll Split", the “Tango” and the “Flirt”. The Black Knights Defence Forces Parachute Team, exhibiting the key military skill of parachuting, will perform a jump from 4,000 feet, while the Irish Air Corps’ EC-135 helicopter, Casa Maritime Patrol and PC-9 aircraft will demonstrate their agility and speed. Father and son duo, Gerry and Harry Humphreys from Limerick, will be making air show history, as Harry (age 21) makes his air show debut in the titanium-built ‘Mini-Mig’. Harry’s father, Gerry, is a former RAF pilot-turned organic beef farmer and he’ll be making his tenth appearance at Bray today, in the aerobatic ‘flying cow’, which is a home-built RV7. The ‘Strikemaster’ and ‘Hawker Hunter’ military jets are making a welcome return, along with the Irish Coast Guards’ Sikorsky S-92 helicopter, which will feature in a search and rescue demonstration along the coastline. Jets from Aer Lingus, Stobart Air, Ryanair and CityJet will also be taking to the skies above Bray and spectators are strongly advised to use Dublin Bus, DART and other public transport services, as traffic restrictions will be in place. Supported by the Irish Aviation Authority, Bray Air Display (#BrayAirDisplay) is part of the Bray Summerfest (#bsf15). The festival includes music, food and craft markets, as well as firework finale display on the Monday, 3rd August.